When it comes to gutter cleaning, the only solution is annual cleaning by professional cleaners. Eavestroughs affect our homes from top to bottom and any blockage or clog can wreak havoc on your home. These clogs are caused by debris, which can be dangerous to clean out. NICK’S Window Cleaning has over ten years of professional eavestrough cleaning in Oakville. We can clean everything related to your gutters, including downspouts and fascias. Eavestroughs are an essential aspect of our homes’ drainage system, safely moving water away from the home, where it can be safely disposed. If your eavestroughs aren’t draining properly, your home can suffer damage in its roof and even foundation, leading to costly and time-consuming repairs. The best way to keep your home safe from drainage issues is to schedule professional eavestrough cleanings every spring and fall. You can schedule set times every year for our gutter cleaning services so you don’t have to worry about missing an appointment. Here at NICK’S Window Cleaning, we train our in the latest and best cleaning principles so that your gutters will look and operate at their absolute best. For residential cleaning, we do our work by hand, scooping out all of the dirt, debris, and build-up in your gutters. It’s the only way to ensure every bit of mess is taken out. For more stubborn stains, like those in post-construction gutters, we have a special liquid cleaner that makes quick work of almost any stain or mess. No matter your needs, we have the skills, experience, and tools to have your gutters working perfectly and looking great. Downspout guard installation: This service helps funnel water more effectively into your downspouts for better overall drainage. Eavestrough flushes: This test is designed to figure out exactly where your eavestroughs are having problems with drainage. We can then replace the problems for a better eavestrough draining system. One of the biggest problems that occur with clogged eavestroughs is standing water. When water sits in one place for too long, moisture can seeps into anything it touches. 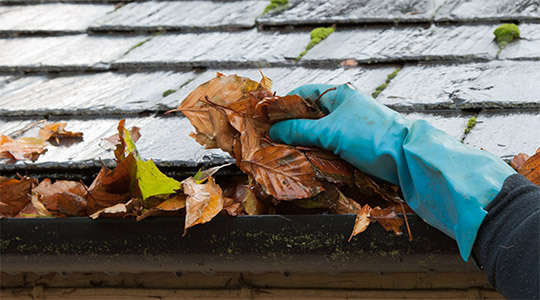 Homes with clogged gutters often end up with severe roof damage that can result in the entire roof needing replaced, which is both time-consuming and expensive. But when eavestroughs are regularly cleaned by professionals, they have a chance to shed that water away and keep your roof strong. Winter poses another problem. Water that drains improperly out of dirty eavestroughs has a tendency to seep into and under anything, from driveways to foundations. When the cold weather strikes, the water freezes and expands, causing even more issues. It can even cause the gutters themselves to pop right off the side of your home. Professional eavestroughs cleaners can provide your home with the proper attention it deserves. This not only helps you save money overall by catching problems before they become bigger issues, but you can also keep yourself safer by leaving this dangerous work to the professionals. Here at NICK’S Window Cleaning, we have over ten years of eavestrough cleaning experience. We can help your Oakville home get the attention it deserves, saving you time and money on the potential damages caused by blockages in your gutters. NICK’S Window Cleaning is becoming the top choice for Oakville eavestrough & gutter cleaning services on properties of upto 3 storeys in height. Our friendly team is fully insured and highly-trained, ensuring your home and property is safe during our services. With a minimum of disruption to your personal time or day-to-day on-goings we will clean your property leaving it looking great, and with fully functioning eavestroughing you won’t have to worry about the rainy season. Customer satisfaction is incredibly important to us and that is why every job is is treated with the utmost of importance and with exceptional service in mind. Contact us today and discover why more people choose NICK’S Window Cleaning for their Oakville eavestrough cleaning & gutter cleaning needs. One of the home maintenance chores that homeowners hate is cleaning eavestroughs. But cleaning eavestroughs is one of the most important parts of home maintenance. Keeping eavestroughs clean and free of standing water is critically important to preventing damage to your home. When eavestroughs are not cleaned regularly that water can back up and lead to serious damage to your roof, walls and even the foundation of your home. Water that leaks from clogged eavestroughs and downspouts can seep into the foundation of your home. Over time that water will cause leaks and cracks in the foundation of your home. Eventually the entire structure of the house can shift because of the leaks and cracks in the foundation. And if those cracks continue to grow the entire foundation of your home could be at risk. Regular cleaning of the eavestroughs is the only way to prevent that kind of water damage to your home. Professional cleaning is always recommended to make sure that there is no damage to your foundation. Mold is another serious problem that homeowners face. Once mold takes root in your home it can be nearly impossible to get rid of. Mold remediation is time consuming and can be very expensive. Not to mention that mold in the home puts everyone in the house at risk for major health problems including respiratory illness that can become permanent. Standing water, leaves and other debris building up in eavestrough is a breeding ground for mold. Professional cleaning will get rid of the conditions in which mold thrives eliminating the risk of toxic mold getting into your home. Professionals know how to safely clean out eavestroughs. They have commercial quality equipment to make it fast and easy to clean out even a fully clogged eavestrough. Homeowners who clean their eavestroughs themselves run the risk of dangerous falls from rickety ladders or not getting the eavestrough fully clean. Don’t take the risk of injuring yourself trying to clean out your eavestroughs. Call a professional who can clean them out for you.